How can Singaporeans achieve better work-life balance? It is no secret that Singaporeans work the longest hours in the world, with the average worker clocking in 2,371.2 hours in 2016. In fact, around 70 percent of professionals in Singapore work longer than their contracted hours. Yet, there has been a desire for change amongst many, especially our generation. A 2018 survey by global specialist recruitment firm Robert Half, 1 in 4 (25%) of Singaporeans would leave their current organization for a better work-life balance. When undergraduates were asked about their career goals upon graduation, regardless of field of study or gender, the top answer was ‘to have work/life balance’ (69%). In 2012, this career goal was only selected by 55% and this number has risen every year since. I feel that in some way, our education system in Singapore, or at least what I’ve been through, has prepared us for the working world. On a university level and in junior college, one would have to balance a heavy curriculum and build your portfolio/resume at the same time. This experience is certainly a good training to learn about how to best balance one’s time. Admittedly, in 2017, I lost track of these useful skills that I’ve learnt. That year, I was not as productive and efficient as I would have liked to be. Even on my honeymoon and wedding day, I was responding to clients’ emails. I was doing a lot of things but perhaps several of these tasks would not have affected whether I managed to exceed my KPI. Looking back, I realized that it did not benefit my organization or myself. When I got promoted in 2018, my responsibilities almost doubled. So, I really needed to get back on track with my time management. Thus, I began to implement a new way of doing things at work. Despite not bringing home work to do at all, leaving on time on most days and not answering emails outside office hours, I managed to exceed my targets and performed better than in the same period in 2017 and also brought back more income to support my family. I’ve managed to sleep at least 8 hours per day on most days, not dream about work at all and come to work exactly at 9AM. I now lead a balanced life with adequate energy and time for the things that were important to me such as spending time with people that I love; conducting house visits; reading about social issues; exercise etc. Hence, in this post, I hope to share what worked for me with other PMEs in Singapore. I acknowledge that it will not work for every single person because maybe we work in different roles, industries, companies or have different life circumstances. However, I do hope that my tips can help improve your situation so that you can spend more time with your loved ones and the activities that matter to you. When I was 19, I came across this blog written by Cal Newport, associate professor of computer science at Georgetown University. This is where I really learnt 80-90% of my productivity hacks from. Cal Newport’s entries shared a simple message – it is not about how hard you work, how many hours you put in but whether the activities you choose to focus on could generate results. His views are rather similar to Tim Ferris, author of the wildly successful book – The 4-hour Workweek – focus and priortize the activities that generate the largest return. How can you define what is important as an employee? The answer lies in your KPI. Often, if your company is well managed, your superior would set a KPI for you that is aligned with the company goals. This would help you make decisions on a daily basis on which tasks to eliminate or deprioritize – Does this task help me hit my KPI now or in the next year? Does it help me get to where I want to go? If an activity is not valuable to the company, why focus on it or prioritise it? Your company would not be getting the best out of the money they invested in you. On your end, you may feel resentful when you realize your efforts are not appreciated (or perhaps only in fluffy words but not in the real way). Nobody wins. For instance, if you’re tasked to write a research report. A worker who works hard would do their best to make every single section perfect. However, a worker who works smart has a different approach He would ask: Is it really necessary to make every section and small detail of the report the best? How about first understanding what your boss or client cares about the most? Which section would make them look good? And then, focusing your energy and attention on those sections? In fact, this could also be applied to activities outside of work such as volunteer work. Before accepting any task, I think about what kind of outcome it can generate for the cause. Only if I truly see a positive impact and ROI, then I would invest more time and effort on it. Once you’ve decided to eliminate or deprioritize certain tasks, the next step is the simplify. Whenever I need to do something, I ask myself – what is the best method to achieve the what I need to do but with the minimum amount of time, energy and effort? While some may perceive this attitude as laziness, I disagree. This is not about being lazy but optimizing your performance and being a highly effective worker. Laziness is when you reduce time, energy and effort and don’t deliver a better outcome. Automation is sometimes one of the best ways to reduce your workload. Last year, I realized I spent a lot of time addressing technical issues. This year, I changed that. First of all, I created templates for the most common kinds of questions I was being asked. When people asked these common questions, I simply changed the name, pasted my standard template and sent it. This reduced my time needed from 20 minutes to 1 minute. I credit my colleague who specalizes in resolving technical issues like this for this useful tip. Instead of trying to resolve all technical issues on my own, which is not what I am the best at doing or even hired to do, I also gradually decided to delegate them to the relevant department in charge. Many of us tend to check emails multiple times a day. However, is this really the most efficient way of working? I disagree based on my own experience. Last year, I found myself pretty much a slave to the feed. When I received an email, I felt a need to reply as soon as possible and drop everything else I was doing. As a result, my productivity suffered. I kept getting distracted by every email or message that was being sent to me. This made me lose focus on the task at end. One things which has helped me significantly this year is to check and reply to my emails or whatsapp only twice a day – once in the morning and once in the second half of the day at work. Through only checking messages twice a day, I was able to deeply focus on my tasks and I had less distractions and interruptions. I would encourage everyone to adopt this at work. It is really not sustainable to be on standby for other people. You must teach people how to respect your time and that they can’t leave things to the last minute and expect you to be there to accomodate their lack of time-management. If you manage your time at work well, it is likely that you can complete it on the day itself, why would you need to be working outside office hours? Furthermore, if the task is not urgent, why not do it the next day? such as LinkedIn and Salesforce. I still keep my email app but am considering removing it entirely as well. I personally don’t see any benefit of using whatsapp for work purposes at all. First of all, unlike emails, I can’t switch it off outside work hours. Secondly, people can sometimes get emotional on whatsapp because the nature of it is so instant. Thirdly, all email communications are logged so people are held accountable to what they say and the way they behave. This gives them an additional motivation to communicate professionally and politely. I would guess the exception for whatsapp will be for some markets such as Indonesia. People seem to use whatsapp as a primary channel for work there. Hence, in such a situation, I feel whatsapp is an absolute necessity. My perspective about time is that you either control it or let it control you. I currently manage my schedule with Google Calendar. Every Monday evening is housework time. Every Tuesday, I would go for house visits. Every Sunday and Thursday evening, I need to clean my rabbits’ litter box. I even plan my annual activities for instance, on the first day of December each year, I will transfer $10k into my CPF Special Account and also allowance for my parents for the entire year. I do this for work as well and this has helped me to stay on top of admin work because on a fixed day of each month or week, I would execute a specific task. When you have fixed schedules like this, it gives you the discipline to complete the task, makes you accountable and also minimizes instances of schedule clashing. I know most people will just ignore this point because “stay healthy” is in almost every productivity hack article. It is cliché but extremely true. There is nothing more time-wasting and unproductive than falling ill and queuing up with other sick people to see a doctor. First of all, avoid carb heavy lunches as they give you food coma. They just make you super tired and work slowly for the rest of the afternoon. I really recommend – salad, yong tau foo with less noodles, caifan with less rice etc. If you work in Tanjong Pagar, there is a $5 salad shop at 1 Tras Link #01-09 Orchid Hotel. I go there almost three times a week. You could also try intermittent fasting – only eating from 12-8PM or 9PM daily. It is not only super good for weight loss but also has several other health benefits. I personally found it to be really great for my energy levels. Finally, you need to complement a good diet with exercise – one of the best methods to combat fatigue. I personally aim for two or more days a week of muscle-strengthening activities that target all major muscle groups. Some examples of what I do include -swimming, playing sports with my friends and going to the gym. Ending off, I hope that people won’t perceive the desire for work-life balance as laziness. 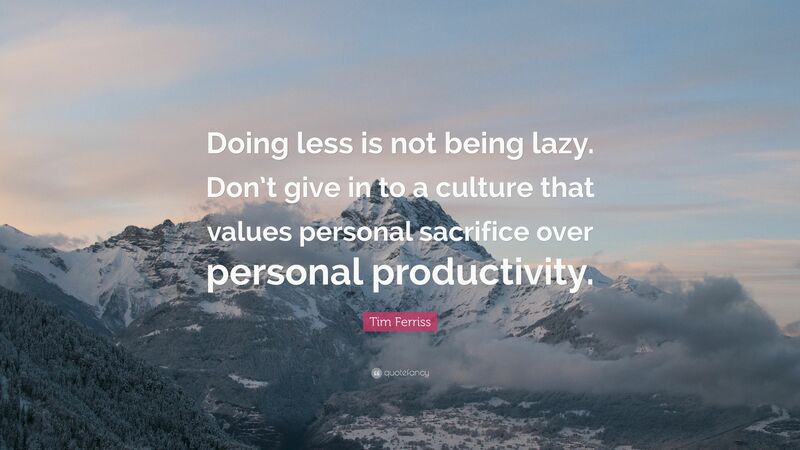 I understand that it may be a common misconception especially in environments that value personal sacrifice over productivity and effectiveness. But hey, even the late Lee Kuan Yew would stop work by 6pm at the latest. He would take a break by playing golf, exercising, unwinding and spending time with the family, before restarting at night when the papers reached his home. I know that our generation gets slammed for it a lot and called ‘entitled’. However, I personally choose to perceive Singaporean millennials desiring work-life balance as a sign of hope that we are one step closer to our dream for a swiss standard of living where workers enjoy both high standards of living and work-life balance. Or, we could even be like Germany, where we can work less hours but produce much more. Hopefully with less emphasis on results than long hours, we can improve our productivity which has been stagnating over the past few years. What are some productivity hacks which you apply at work or with your life? Let me know in the comments below.